I've been so busy, tired, overwhelmed you name it I can't even come up with my own posts. I found this image over at Black Eiffel, a lovely blog that I just came across and decided it was worth posting here. 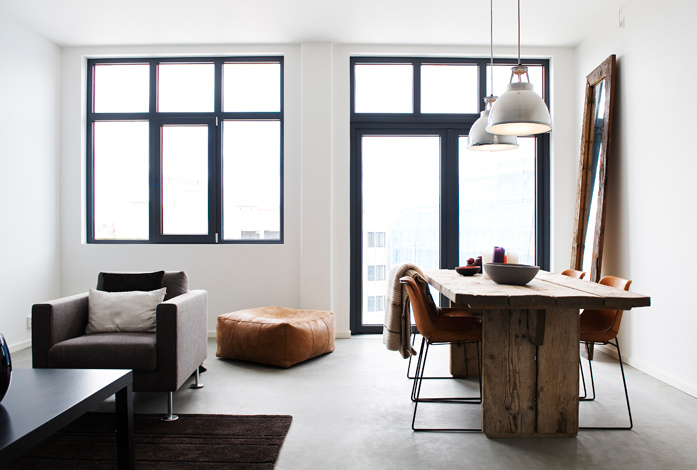 I love the combination of the natural wood and leather with the concrete floors and steel windows. i need that leather pouf thingy. love love love your blog! Do you ever need or use assistants? I am a wardrobe stylist and I also do set styling. Would love the chance to work with you in some capacity! !